Odds are only a representation of something more important – probability. Getting a handle on how to calculate probability and convert it into decimal odds is the first step in developing your own assessments of betting value. There is a conversation that all seasoned bettors will have had numerous times with friends and relatives who want a casual bet on a major sporting event. What are the odds on x? What do they mean? What will I win if I bet x amount? Understanding odds is the biggest challenge that anyone new to betting faces. But what do odds actually represent, and how can you understand the return value for a given stake? Once you get past that hurdle, you can compare odds between bookmakers. However, if you consider betting to be just about odds, you’re missing the bigger picture. To really expand your understanding of odds and betting, you must also understand how to calculate probability. Betting is about assessing the chance or probability of an event happening and bookmakers like Pinnacle use odds to translate probability into a more usable form in order to offer betting. 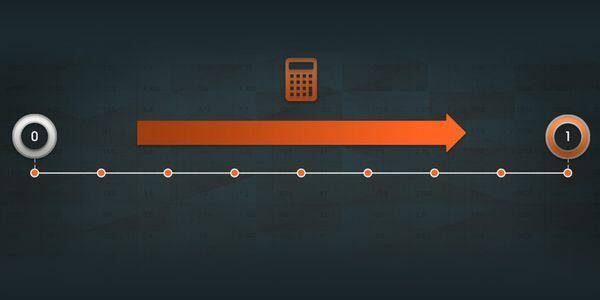 To really expand your understanding of odds and betting, you must also understand how to calculate probability. The fact that there are many different odds formats – American, Decimal and Fractional – illustrates the point that odds are simply a means to an end i.e. offering betting. Bookmakers really deal in risk measured by probability. Considering how we are faced with risk every single day of our lives – what are the chances of me making that train on time? how likely is it to rain? – it is suprising how unfamiliar the average person is with being able to calculate probability. It’s a scale running from 0 – where there is no chance of an event occurring – to 1 – a certain future event – with the likelihood of all other potential events falling somewhere between those points on the probability spectrum. As a bettor you want to know the probability of your chosen call – the favourable outcome – which for this example we will say is Heads. Therefore to get your value divide by the two possible outcomes – Heads or Tails – to produce a probability of 0.5. In general people are more comfortable with percentages, so by multiplying the probability of your event (0.5 for Heads) by 100 you can say that there is a 50% chance of the coin landing on Heads, and you winning your bet. Now you know how to calculate probability, you can turn this into odds. Decimal odds are the default format used by bookmakers like Pinnacle. It may be useful to learn how to convert fractional odds into decimal odds. Take your newly found knowledge and work out the implied probability for your coin toss with your friend and you’ll see the aggregate implied probability of both outcomes in the coin toss is 100% – (0.5/1+0.5/1)*100 – no surprises as a certain event is 1 (100/100). However, performing the same calculation for actual odds from your favourite bookmaker will produce a value greater than 100%. So what is happening here? Being able to calculate probability and understand where odds actually come from is an essential part of evolving as a bettor. In simple terms the odds don’t reflect the true likelihood – the probability – of the outcomes concerned. The amount by which the implied probability diverges from 100% is the edge your bookmaker holds for that market, and essentially measures the value they are providing. This is an essential piece of information for a value seeking bettor, is easy to calculate but few if any bookmakers publicly share it – other than Pinnacle. It’s worth asking yourself why that is? So if you bet €10 on Heads with odds of 2.0 your return including stake is 2.0 x €10 which equals €20 (this includes your €10 stake + €10 profit). Being able to calculate probability and understand where odds actually come from is an essential part of evolving as a bettor because it enables you to calculate your own expected frequency for an event – starting to model your own odds – and then compare what you think will happen with what odds are available. Where the two diverge you can potentially turn that edge in your favour, and generate profit, which is what a bettor should be focused on.